Book 2 Gypsy Cradle is done – the hounds are released! Yesterday, book 2 in the Gypsy Quadrilogy (is that even a word? Heck, it is now) released on Amazon, iBooks, Nook and Kobo. I got so caught up in my day job (I’m a resume writer and copy writer to earn my daily bread) that I wasn’t able to refresh the page every few seconds, although I did send out emails announcing the big day was coming. I did quite a bit of promotion for book 1 Gypsy Hunted, and so luckily had previously received fan email and enthusiastic and kind folks had gone to the trouble of reviewing it. I sent them a copy a couple of weeks ago. So I wasn’t prepared to get an enthusiastic email this morning Oz time from Gina, who enjoyed the books, and is excited about the 7 books I have planned out (two series). Feedback from readers makes my day, and four five star reviews while I slept oblivious to what was going on is the icing on the cake. What a rush. Absolutely made my day. I have big plans, and am writing like the wind on the prequel (which I will venture to say is so much fun to write and therefore hopefully more fun to read). Each novel I am learning so much thanks to my line editor Therese Arkenberg (don’t inundate her with work folks, otherwise she will get too busy to help me) which makes writing each book more rewarding. I feel like a god. I’ve wanted to write for a long time, more years than I care to admit. But better late than never. My work here is definitely not done. Gypsy Cradle (Book 2 of the Gypsy Series) is just around the corner! For those of you that enjoyed the first book in the series “Gypsy Hunted” you will be pleased to know that Gypsy Cradle, book 2 is progressing nicely and will be available for pre order in just a matter of weeks! The first draft of a book cover design has arrived, and although it needs some tweaking (I’m not keen on the font and kerning or letter spacing) I can reveal it to you today. Here it is. Feedback, comments, thoughts, questions? What’s an author to do on Christmas Day lunch? If you’re like me, of course you discuss casting for the movie version of Gypsy Hunted, which I dream one day will be made. Thanks go to two people very close to me on this one. My sister Carla and my son Conan. They’ve both read the book and understand the characters very well, in fact judging by their casting choices, they know them better than I do. They are perfect! And there you have it! Well done team love your work! Results from first kindle countdown promotion – A success? Yes…. As I’m based in Melbourne I went to sleep the first night dreaming of making the top 100 best seller list the next morning. As my book started with a ranking of #113,000 and was selling maybe 7 copies a week tops, I think I was living in la la land there. I was so excited at the jump in ranking I took screen shots as I went so here is a runnning tally of progress in pictures. Note; 80% of the promotion websites sent out their emails to readers on the 15th. Two websites, Digital Books Today and Ebook lister did so on the 16th. I’m still unsure whether it is those two websites that got such big numbers on the second day (16th) or whether this was a follow on snowball effect from the day before. So would I consider it a success? Definitely. I sold 263 books over 6 days. Compared to my pre countdown deal average of of less than 1 book sale a day that’s over 250 people that now have my book. Currently the book is ranking around the #14,000 rank mark and selling 8 books per day. Of course that will decrease over time, but considering I made back the costs of the promotion and then some, I’m very happy with the promotion overall. I’m experimenting with my very first Kindle Countdown deal from 15th to 20th December 2014. 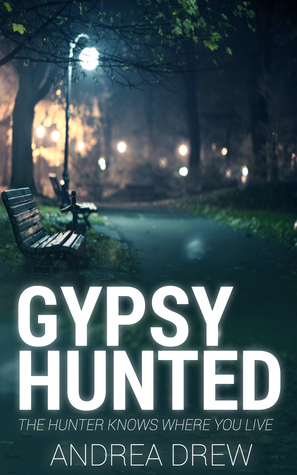 Gypsy Hunted will be reduced to 0.99 for six days. I’ve spent nearly $200 on advertising to promote the deal. For my fellow authors, I’ll dissect the results of my promotion a day or so after its done and dusted. I’ve also got a couple of lovely ads designed by Debby Pence. Thanks Debby. Here’s hoping I get lots of sales out of this promotion! Life spins out of control for London architect Kate Benedict when suddenly, she sees a dancing aura above certain people’s heads that seems to signal death. Suddenly she’s psychic It can’t be! Psychic’s not acceptable in her circle, where the supernatural is strictly for the superstitious. And yet…people are dying. People close to her. Kate’s tentative attempts to talk about her new-found metaphysical gift are met with eyerolls, so much so that she can’t even tell the nice Scotland Yard detective who’s investigating the death of a close friend, Rebecca Williams. And now Rebecca’s neighbor has an aura! So what’s Kate to do but try to save him by turning detective herself? A break-in and attack on her boy friend confirm that the murderer’s catching on that Kate knows too much. But he (or maybe she) has no idea that what Kate knows is a little on the paranormal side. Fans of traditional British mysteries (and female sleuths) will love watching competent, reasonable Kate try to harness supernatural abilities she not only doesn’t understand, she doesn’t even believe in! And those who love international mysteries will particularly enjoy the vivid scenes in Italy, where the story begins and, in some ways, ends. WHO ELSE WILL LIKE IT: Anyone looking for a new, fresh female sleuth, as well as fans of paranormal suspense, traditional (yet not too cozy) stories, contemporary British women detectives like the ones found on the BBC’sROSEMARY AND THYME and MURDER IN SUBURBIA, and mysteries with a metaphysical twist, like Kay Hooper’s Bishop Files series, Iris Johansen’s THE PERFECT WITNESS, and Heather Graham’s Krewe of Hunters books. “Carrie Bedford is a real find, and The Aura is engaging paranormal suspense … Bedford is a fine writer, an accomplished novelist, and a terrific storyteller whose characters ring true and pull us deep into the mystery.” -Shelley Singer, author of the Jake Samson-Rosie Vicente mystery series and Torch Song, first in the Blackjack near-future thriller series. 1. Did you do any kind of research to determine the details of your characters’ lives / lifestyles? Yes, lots. I enjoy the research component of writing and it is also the perfect excuse to not actually write! For my first book, which is historical fiction, I spent years, really, to gather all the information. For The Aura, the research was less intense, more focused on things like checking geographical details, or learning how an architectural firm works. The Aura sequel takes place in a medical setting, so I’ve done lots of research on hospitals, morgues and the pharmaceutical industry. 2. The best book/s you ever read? I’m not sure I can point to just one. I have eclectic tastes. I’ll read anything from Shakespeare to Clancy and my kindle is crammed with books that I think are brilliant: Bel Canto by Ann Patchett, The Woman in White by Wilkie Collins, A Passage to India by E.M. Forster, most of the Brontes’ books, The Name of the Rose by Umberto Ecco, anything by Arturo Perez-Reverte. Recently, I read Anthony Doerr’s All the Light We Cannot See and Adrian J Walker’s End of the World Running Club. 3. Do you have strange writing habits? I started writing when I was still working full-time with two young daughters at home. I worked on a laptop and took it with me everywhere, using the waiting time to write, regardless of the location — dentist offices, dance studios, sitting in a car park. I developed the ability to write in short bursts of activity and still do that, although now I’m lucky enough to have more time and often write for hours without a break. In London. I love that city and visit it often. It was a natural choice of setting for The Aura. 5. How did you get into writing? I won a Greater London Essay Competition when I was young, and always wanted to write fiction after that. All through college and my career, I wrote, but it wasn’t fiction. About eight years ago, when I was living in Italy, I was inspired to write a historical novel about the Roman empress Galla Placidia. I took some online writing classes, met some talented and inspirational classmates and I haven’t stopped writing since. 6. What was the most surprising thing you learned in creating your books? I think it was discovering what a kick writing is! I get the same kind of endorphin rush when I’ve had a good writing session that I experience when I exercise. And I was also surprised by just how absorbing writing can be. I inhabit my fictional worlds and talk to my characters. It’s a wonderful retreat when I need a rest from the real world! 7. you think that the cover plays an important part in the buying process? Yes, I do. As a reader, I always look at the cover before considering buying a book. If the cover is attractive or intriguing in some way, I go on to read the jacket copy to see if it’s something that will interest me. I think a badly designed cover can turn off or mislead potential readers very quickly. It’s a quote that a friend and fellow novelist gave me. I like because it applies to writing and life and everything in between. I must not fear. Fear is the mind-killer. Fear is the little-death that brings total obliteration. I will face my fear. I will permit it to pass over me and through me. And when it has gone past I will turn the inner eye to see its path. Where the fear has gone there will be nothing. Only I remain. — Frank Herbert, Dune. 9. What do you consider your best accomplishment? I think it would be what so many women accomplish every day. Having a career, and children, a marriage and a (time-consuming) hobby and finding ways to make them work together — and remembering to be grateful for all of them. But if I had to pick one, it would be being a mum. I love it! 10. What’s the worst job you’ve had? It was a summer job when I was a student, working in the accounting department of a large manufacturing company. No computers, just adding machines. Eight hours a day of staring at numbers in a windowless room full of people all doing the same thing. It was mind-numbing – the antithesis of creative writing. 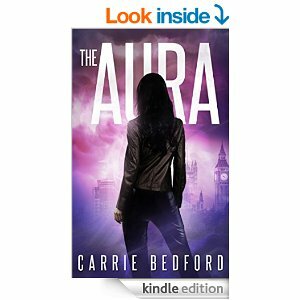 I’m very pleased to announce that in coming weeks I’ll be interviewing the lovely Carrie Bedford, author of “The Aura” a paranormal mystery. Carrie is a fellow author published in the same category as I and I’m really looking forward to learning more about her. The Aura is selling nicely and I’ve started reading it, a good read! Please welcome her, and check out the Aura!